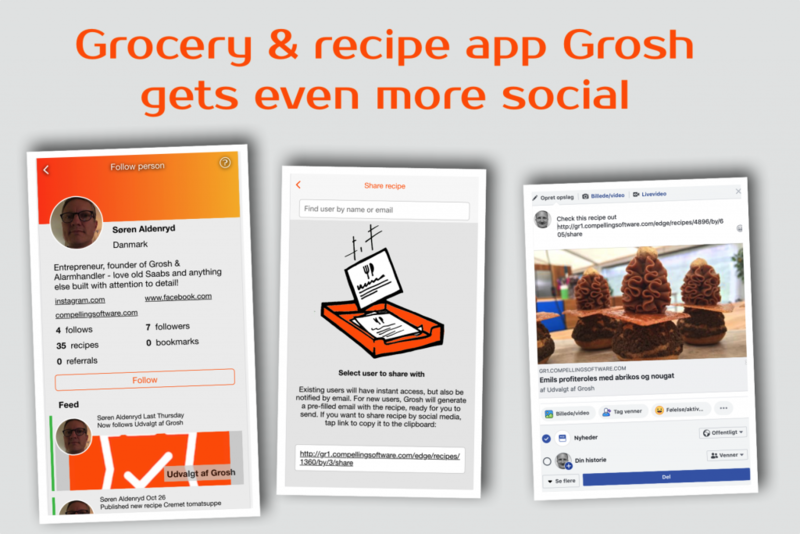 Grosh is a grocery shopping and recipe app that aims to give everyone more inspiration in their daily cooking. In our latest update, Grosh 3.2 we have improved how users interact with each other in Grosh. Read all about it here! We’ve improved the Grosh user profile, such that you can add a description and link social media profiles to your Grosh profile. This information is shown together with a feed of your latest public actions in Grosh, like following a person or publishing a recipe. This will make it easier for users to select the right person when they are sharing a list, recipe, or want to follow someone they know. At the same time, we’ve made it easy for you to share your Grosh profile to other users. You can send them a link which will present your user profile with a Follow button on it. Very handy for influencers who are starting to use Grosh for sharing recipes. To find the link to share your profile on social media or mail, simply tap Settings – Followers – Adjust. Until now, you needed to login to see anything in Grosh. We’re working on changing this, so various public information can be seen without logging in. The first step is that when you share a recipe e.g. on Facebook, the link can now generate a preview with image and title shown on the social media. The same actually now also goes for your user profile if you share your link to that. If users decide they want to see more and perhaps bookmark the recipe or follow the user, they need to login to Grosh. Until now, the shopping part of Grosh has focused on making you more effective when shopping groceries in physical stores. With Grosh 3.1 we opened up Grosh to become a grocery marketplace that also lets you order groceries online. Check out our blog post about it. We currently in dialog with resellers in several countries and we’re been improving the marketplace based on their input – better display of offers, support for branches, ordering for pickup etc.